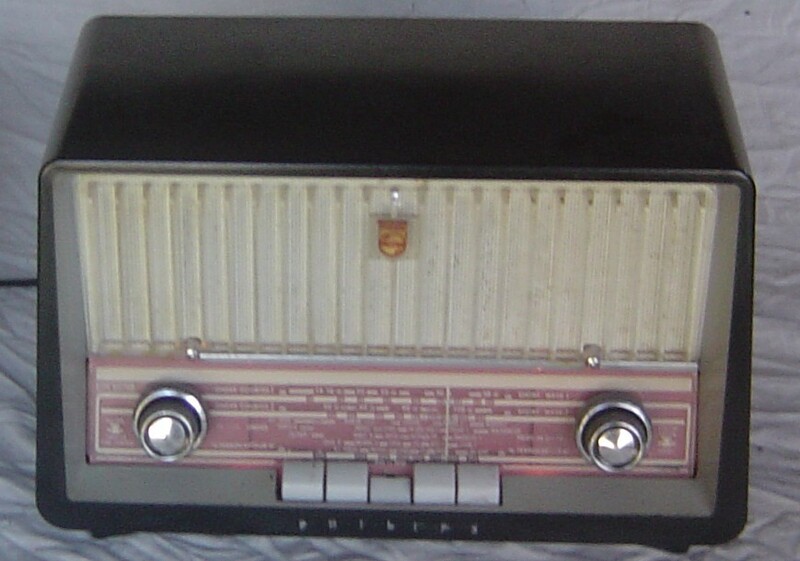 The Philips model B3X75U is an imported radio, made in Holland in 1957. It is a 5 valve superheterodyne receiver, and covers the broadcast band and two shortwave bands. The bakelite cabinet is in the European style with five push button piano style keys to change bands and has two knobs. The labels are in two languages. It has the label FERROCEPTOR to indicate slug tuning. The left hand push button is labeled ARRET/OFF and turns the radio power off. All other push buttons turn the radio on. The next push button is labeled PU and is used for audio input from a record player or pick up. The middle push button is labeled PO/MW and selects the broadcast band. The next push button is labeled OC2/SW and is the second short wave band. The right hand side button is labeled OC1/SW and is the first short wave band. The left hand knob is a dual concentric knob, with the larger outer knob as the volume control, and the smaller central knob as the tone control. The right hand knob is in the same style, but both knobs are the tuning control. The dial scale is labeled in meters, with MEDIUM WAVE being 200 to 550 meters, SHORT WAVE 2 being 50 to 120 meters, and SHORT WAVE 1 being 14 to 44 meters. The dial scale is a also labeled and with European radio stations, like Marchl, London, Lisboa, Budapest, Porto11, Tripoli, Paris, Hilvers1, Praha, Bermunster, Velthem, Rabat, Roma, Aleppo, Bruxelles, Oran, Hilvers, Sofia, Lisboa, Lyon, R.C.Porto, Brussel, Cairo, Cyprus, and Tel Aviv. The radio is a transformerless design, commonly called an AC/DC set, or hot chassis set. This is because one side of the power input lead is connected to the chassis. This can be a safety issue, if the mains cable or plug has a reversal, or if the power socket or house wiring is wrongly connected. The radio is totally enclosed to prevent the user from coming into contact with any metal parts, but this does not protect the serviceman. The safest way is always use an isolation transformer when working on transformerless radios. The advantage of transformerless designs, is the cost saving of having no power transformer, and the ability to run the radio from a DC mains supply, which was used in Europe and the UK, in the 1930s. I added an external 240 to 110 volt transformer, permanently wired in, to make the radio safe. The radio can run from 110 V or 220 V, by setting a switch. The higher setting uses a large wire wound dropping resistor. The valves are European types with unusual heater voltages. 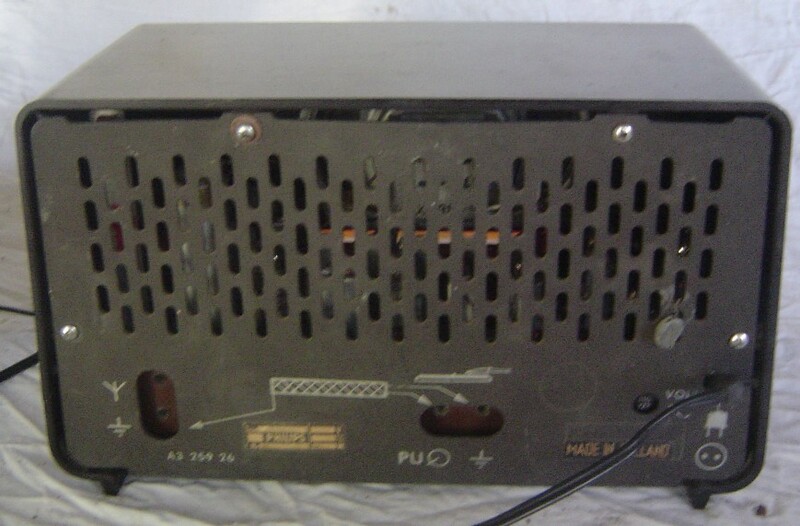 The UY42 has a 31 volt heater, the UL84 has a 45 volt heater, the UBC81 has a 14 volt heater, the UF89 has a 12 volt heater, and the UCH81 has a 19 volt heater. When all the heaters are connected in series, they add up to 121 volts, and can be connected directly across the mains. They all draw 100 mA. The UY42 rectifier is a single diode with an indirectly heated cathode. The heater cathode insulation is high, for mains isolation. It uses a RIMLOCK base, which is an 8 pin miniature base with a bump on the glass, to key into the socket. All the other valves have 9 pin miniature bases. The UL84 audio output valve is a pentode. The UBC81 is a triode double diode and is used as an audio pre-amplifier, detector, and AGC diode. The UF89 is a pentode and used as the 452 kHz IF amplifier. 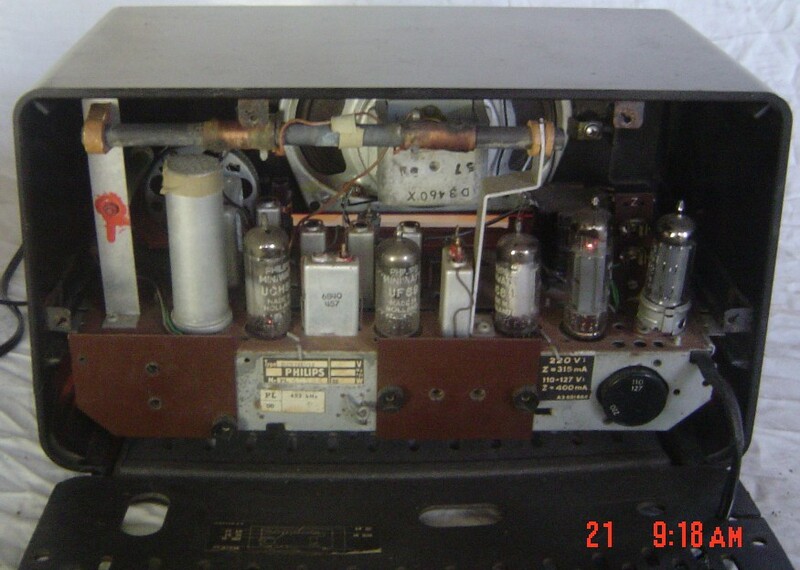 The UCH81 is a triode heptode and used as the oscillator and mixer. It has a ferrite rod as the internal aerial. The radio is quite sensitive and works well. 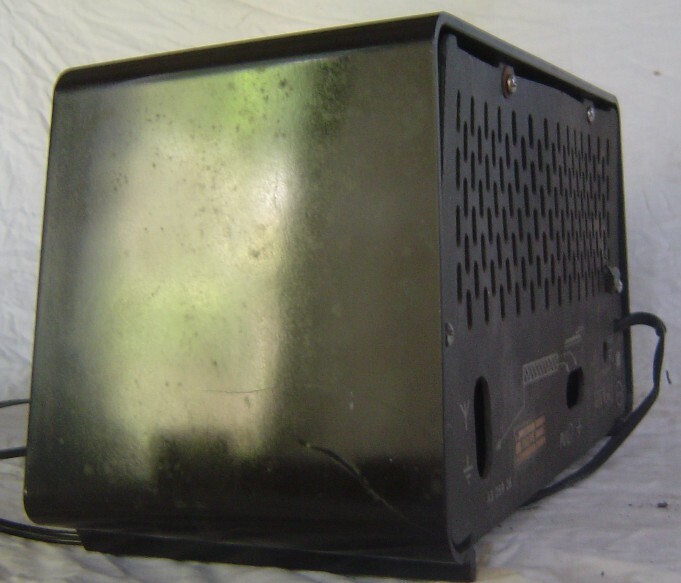 When I got the radio, it was disassembled in a cardboard box. Luckily all the parts were present. I was quite wary of working on this radio, due to the reputation that transformerless sets have. So I used an isolation transformer while it was out of its case. I also used a variac to bring up the power slowly. I replaced the audio feed capacitor from preamp to audio output, as it was passing some DC. The soft hum came up and the radio began to work. The sensitivity was low, so I aligned the IF, but one of the slugs broke. I dissembled the IF transformer and repaired it. The sensitivity was much improved. The switches needed cleaning to make the short wave bands work. I found a box, a 240 to 110 transformer, and permanently wired it in the mains lead. I noticed a crack in the glass of the audio output valve, but the radio continues to work, ignoring this fact.